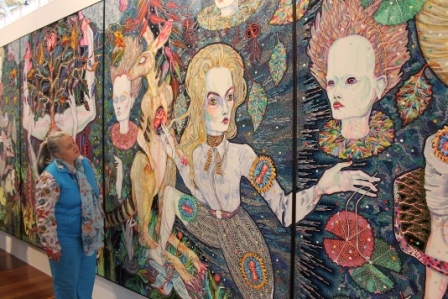 The Melbourne Art Fair is one of Australia’s leading contemporary art events for the year. It gives galleries and their artists an outstanding opportunity to present “a rich and diverse cross-section of the regions’ visual art scene and directly contributes to the livelihood of living artists” (Melbourne Art Fair. 2014). It is held within the magnificent historical World Heritage listed Royal Exhibition Building; and positioned next to the Carlton Gardens, Nicholson Street, Carlton. The building itself consists of “meticulously-restored opulent interior, expansive galleries and soaring dome” (Royal Exhibition Building, 2014). It is breathtakingly beautiful and in my opinion, really out shines any art work exhibited within its grandeur space. This Slide Show below consists of photos taken of the Royal Exhibition Building, Carlton Gardens and the Josef Hochgurtel Exhibition Fountain surroundings. On this beautiful late winter, sunny day in August 2014 – my husband and I ventured into the city to experience this major event. Our art therapy journey for today began as we walked along the path through the Carlton Gardens towards the impressive Josef Hochgurtel Exhibition Fountain of 1880 which is located along side of the Royal Exhibition Building. We took some moments to appreciate its beauty. The fountain is the largest and most elaborate in Australia; it incorporates frolicking putti, fish-tailed Atlantes, goannas, platypus and ferns (VHD Heritage, 2014). It is the artist’s only known work in Australia (VHD Heritage, 2014). On entering into the Royal Exhibition Building itself, it is hard not to be sweep away with its grandeur. Below is a series of photos taken to help viewers appreciate the expanse of Melbourne’s Art Fair from varying angles throughout the building. During our roam through the Melbourne Art Fair we had the opportunity to view approximately 70 leading Australian and International galleries. These galleries represent approximately 300 artists eg: Painters, sculptures, photographers, along with video and installation contributors. Please click here for a list of exhibitors present on the day. The following Slide Show below consists of photos taken of some of the Exhibitors throughout the Royal Exhibition Building. Being located in such a venue gives both Gallery owners and artists alike an amazing opportunity to showcase their wares in most spacious surroundings. It also allows the viewer/buyers of art works much room to move freely throughout the venue in a warm and inviting atmosphere. It feels like one giant art gallery! And then there was the art work itself, truly amazing – imaginative, playful, serious, ingenious, thought-provoking, beautiful and sometimes puzzling. There were a number of works of art that grab my attention more than others. One of them was called Le Vol (Part 111) Inkjet print on vinyl wallpaper, 260 x 410cm by photo artist Valerie Sparks. Her monumental wall work took me into a magical world. Below is a series of photos taken on the day and should you wish to know more about any of the images/works of art – please refer to Melbourne’s Art Fair Online Catalogue. Here below in a photo my husband took of myself on this day, you will find me mesmerised by Del Kathryn Barton’s amazingly intricate, 5 panelled work of art titled ‘The Heart Land’ 2013/2014 – synthetic polymer paint on polyester canvas. The more I gazed upon her work the more surprises I found – very interesting and engaging! Del Kathryn Barton’s art work was a stand out for me during our visit to this year’s Melbourne Art Fair. Melbourne Art Fair August 2014 at Royal Exhibition Building – Photo taken by Husband of Karen Robinson visiting fair IMG_0477.JPG Amazing 5 panel work of Del Kathryn Barton. It was an amazing opportunity to view what others do! It would have been good though – if there had been more information about each of the works of art along side of its display. The back story, the story that helps the viewer of the art work to understand better what inspired the artist to create such art work…but that’s another story! This entry was posted in Art Exhibitions of other Artists, My art and tagged Abstract Blogger, Abstract Painter, Art Therapy, Carlton Gardens, I do art Karen Robinson, Josef Hochgurtel Exhitibiton Fountain, Karen Robinson, Melbourne Art Fair, Melbourne Art Fair Artists, Melbourne Art Fair Exhibitors, Photography, Royal Exhitibion Building, Visual Art Scene by idoartkarenrobinson. Bookmark the permalink.